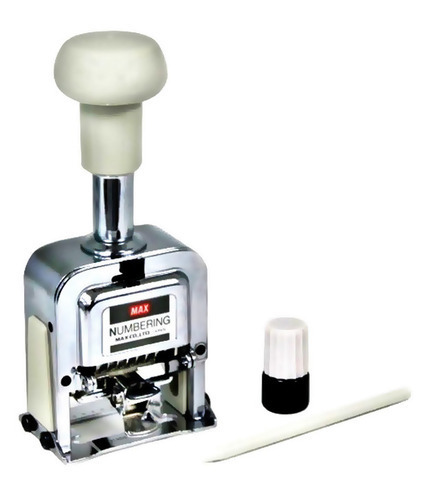 Type : Stamping Machines No Of Fonts : 6 Dimensions : 6.4 X 4.3 X 14 Features: Non-Strip Handle. *Full Metal Frame Designed For Smooth Operation And Long Life. *Built-In Drop Cipher Feature. Weight:400G. Dimensions : (140 X 64X 43 Mm). 7 Action: 1.2.3.4.6.12 Repeating. Made In Japan. Best Quality Numbering Machine In The World. Type : Stamping Machines No Of Fonts : 6 Dimensions : 6.4 X 4.3 X 14 Non-Strip Handle. *Full Metal Frame Designed For Smooth Operation And Long Life. *Built-In Drop Cipher Feature. Weight:400G. Dimensions : (140 X 64X 43 Mm). 7 Action: 1.2.3.4.6.12 Repeating. Made In Japan. Best Quality Numbering Machine In The World.